As we’ve witnessed over the past several weeks, the markets do not have any guarantees. 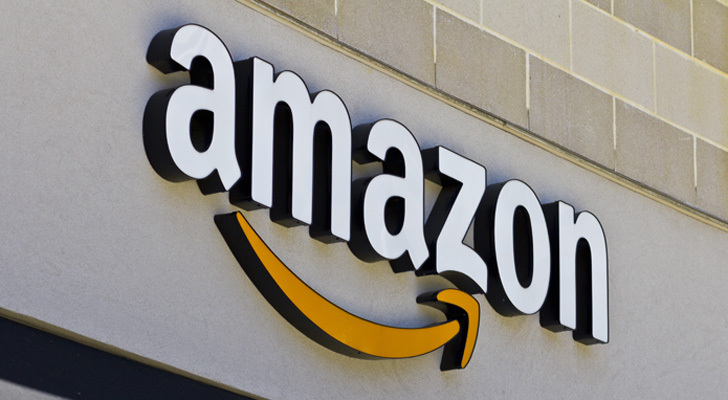 The one possible exception could be Amazon.com, Inc. (NASDAQ:AMZN). AMZN simply doesn’t commit many errors. When it does, the results are inconsequential at worst, and a buying opportunity at best. Case in point was the last time AMZN earnings failed to meet expectations. That was last year in the second quarter, when earnings per share came in at 40 cents against a forecasted $1.42. At the time, Amazon stock had recently breached the all-important $1,000 barrier. Analysts wondered if the incredible momentum could last. We got our answer in Q2, which was a decisive no. Due to the steep 72% negative earnings surprise, the awesome AMZN bull rally stopped dead in its tracks. A few weeks later, shares were firmly back in triple-digit territory. Of course, the pessimism following the Q2 AMZN earnings didn’t last. The company kept firing on all cylinders, and year-to-date, it’s up over 24%. Consider this little tidbit when you ask yourself: Should I buy Amazon stock? Still, a market isn’t a market without people willing to take the other side of the trade. And the one big risk for this and future AMZN earnings is Amazon Prime subscriptions. Recently, Amazon CEO Jeff Bezos announced that Prime subs hit the important 100 million milestone. Experts predicted that success, yet the markets weren’t necessarily enthused. In March, shares dropped 4% and in the current month, Amazon hit choppy waters. Several analysts note that while Prime sub growth was extremely impressive, it’s not possible to maintain that growth curve. It’s an understandable concern, and it weighed heavily prior to the AMZN earnings report. Still, is that a reason to stay away? I’d argue that the critics are being unnecessarily pessimistic. For Q1 2018, consensus estimates peg earnings per share at $1.26, which is a reasonable target based on its recent successes. This is also near the upper end of the estimate spectrum, which ranges from 66 cents to $1.79. Also worth mentioning is that Q1 is a particularly strong season for the AMZN earnings cycle. Since fiscal 2014, the e-commerce giant has at least hit EPS expectations. Moreover, in the year-ago quarter, Amazon delivered an EPS of $1.48, which was substantially higher than the $1.09 consensus. In Q1 2016, the company produced a massive 84% earnings surprise. Statistically speaking, it’d be far better for bears to attack during Q2 or Q3. On the revenue front, analysts forecast $49.5 billion. This is well into the optimistic side, where estimates range from $45.9 billion to $50.8 billion. It’s also a significant lift from the year-ago quarter, where Amazon hauled $35.7 billion, or a potential 39% increase. If there’s any sentiment risk, it would likely be with top-line sales projections. The aforementioned 39% year-over-year increase is an aggressive target. Short traders are angling for any holes in the mercurial growth story, and could punish AMZN stock for falling short. With that said, it’s not at all irrational. On an annual basis, revenue growth averages 26% since 2014. More importantly, the trend has consistently ticked up. I completely get why some traders adopted a cautious approach heading into the AMZN earnings. While I half-joke that Amazon stock is an automatic investment, you must be vigilant with anything that involves money. That said, I believe some bears are looking too deeply at the details, attempting to find weaknesses that don’t exist. For one thing, it’s true that Prime sub growth can’t consistently produce double-digit growth on sequential, quarterly basis. That’s just an unrealistic expectation. Any company, including Amazon.com, will have bad days; it’s the nature of the business. However, if you drill down into the details, rather than finding vulnerabilities, I find strength. Since December 2013, Amazon Prime’s user growth averages approximately 14%, inclusive of the recent Q1 data. And throughout 2017, we saw 11.6% sequential growth. 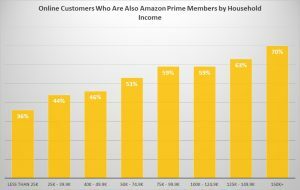 But the truly important statistic to consider is the share of online customers who are also Amazon Prime members, broken down by household income. As expected, the affluent find enormous value in Prime. Approximately 70% of people who earn $150,000 or more, and who shop online, are Prime members. Moreover, over half of online customers who make between $50,000 and $125,000 are also active Prime users. This broad income bracket essentially represents most upscale retailers’ target demographic. Which is to say, don’t worry about Amazon stock. The company actually does have the potential to maintain, even accelerate, Prime memberships. Article printed from InvestorPlace Media, https://investorplace.com/2018/04/amazon-com-inc-amzn-stock-earnings-litmus-test-growth/.